Women's stories have not exactly been turning up thick and fast during the First World War period in Barnsley, so when a name I have had 'on file' for a while is finally resolved it's a time of quiet jubilation for me. I was aware Gladys Alderson's name in connection with the YMCA during WW1 because she is one of just four women listed on the 1918 Absent Voters' List for Barnsley. Her occupation was listed as "YMCA Canteen" and her address was 31 Huddersfield Road; at the same address was a Major Lionel Alderson, of the Army Service Corps. I could have pursued the usual family history routes and found out if this pair were married, who their families were and so on, but without more information about Gladys' YMCA work it didn't seem worth going in that direction at the time. Last weekend I started reading Kate Adie's recent book Fighting on the Home Front which describes the role of women in WW1. In chapter eight she covers the work of the YMCA's Women's Auxiliary Committee who provided 'voluntary lady workers' to staff YMCA huts in France which supplied a wholesome alternative to the various cafés and estaminets. The huts provided a place to sit, paper on which to write letters home and hot drinks and biscuits. The workers had to pay their own way, although a small grant was available for uniforms, which was grey with a straw hat in the summer and a velour one in the winter, so they were mainly from the middle and upper classes. One lady named in Kate's book, a Betty Stevenson, was killed by a German bomb and was given a military funeral and a French Croix de Guerre for her devotion to duty. 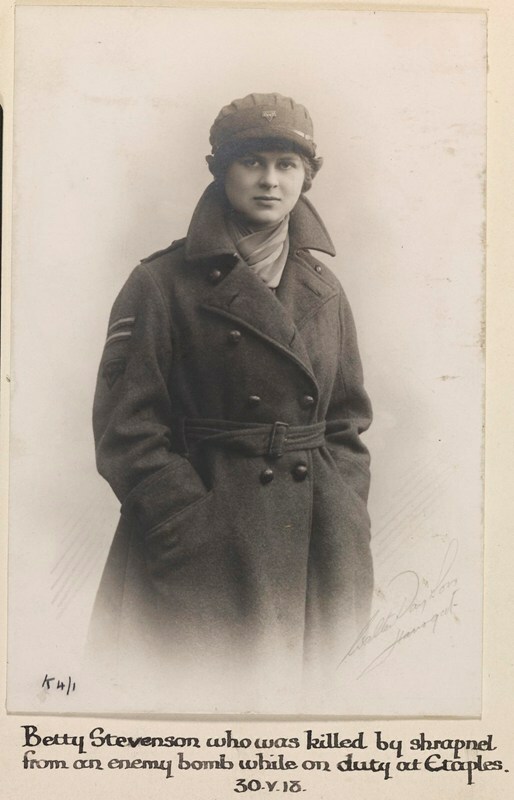 This photo of Betty is taken from her Life Story on the Imperial War Museum's website Lives of the First World War which has been well populated with detail by IWM staff and other interested parties. Being an experienced user of the site I was able to see that one of sources used to create Betty's (or Bertha to give her official name) story was her medal card. I have only recently learned that volunteers who worked for organisations like the YMCA and the Salvation Army qualified for British campaign medals. Women's medal cards are available via The National Archives online but not via Ancestry unfortunately. 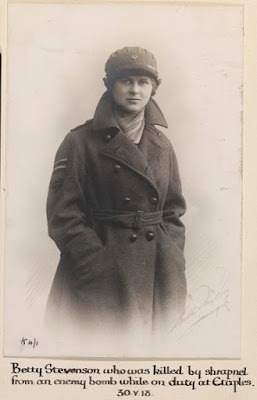 Gladys Alderson's Life Story had been 'seeded' onto Lives of the First World War along with the other YMCA recipients of campaign medals and once I had found her I clicked the 'Remember' button so that a link was saved to my dashboard for future reference. I was able to find Gladys Alderson's record at TNA but was unwilling to pay £3.30 to view it. A colleague on the Lives Facebook page suggested I look at the partially hidden preview of the card as sometimes it is possible to make out useful information. The year 1917 is visible at the centre bottom of the card on the line which usually gives the date a person first entered a theatre of war. That is indeed useful, but I am still not tempted to buy the full image of the card - I'll leave that to any interested relatives. Having discovered a little more about what Gladys would have been doing as a YMCA Canteen Worker and now knowing that she did serve abroad I was more inspired to investigate more of Glady's story. Gladys Helen Audrey Thomson was born in Wath upon Dearne in 1887 to Joseph Frederick Thomson, a mining engineer from Houghton le Spring in Durham. Her mother Mary Ann Jane Mossom was from London and her parents had married there in 1870. In all there were twelve children born to the couple but three had died before this information was recorded in the 1911 census. In 1901 Gladys is not enumerated with her family but instead appears under the name Audrey Thomson listed in London in a school lodging house along with several mistresses and lots of other young ladies. I am used to seeing young men away from home at boarding school in the census returns, but it is comparatively rare to see examples of middle class women's education. Still using the name Audrey she has returned to Wath by the 1911 census and is listed with her now widowed father and five of her surviving nine siblings at Dunholm, a house with fourteen(!) rooms. She marries from here in 1913 and a report appears in the Yorkshire Post on 5 February 1913 (accessed via Newspapers on Find My Past). The wedding took place at Wath-on-Dearne Parish Church yesterday, of Mr. Lionel William Alderson, son of Mr. C. Alderson, of Wellfield House, Barnsley, and Miss Gladys Audrey Thomson, youngest daughter of the late Mr J.F. Thomson, of Dunholm, Wath-on-Dearne. The Revs. H.E. Alderson, C.E. Whiting, and W. Keble Martin (Vicar of Wath) were the officiating clergymen, and the service was fully choral. The bride, who as attired in a gown of ivory satin charmeuse, draped with Mechlin lace, and full court train, was given away by her eldest brother, Mr A.T. Thomson. The bridesmaids were Miss K.F. Thomson, Miss B.W. Thomson, and Miss Alderson, who wore dresses of Parma violet ninon over satin charmeuse, with satin coatees. After the ceremony a reception was held at Dunholme [sic], and later Mr. and Mrs. Alderson left for Switzerland. The Aldersons settled at 31 Huddersfield Road in Barnsley but sadly they do not seem to have had any children. Lionel, who had been born in Wakefield in 1885, was the second son of Charles Sibbald Alderson, a bank manager. His occupation is given as manager of a bleach works in the 1911 census when he is living at Wellfield House, in Barnsley. Lionel's older brother Bernard Henry Alderson, who was unmarried, accidentally lost his life in the First World War and was remembered on the memorials at St George's and St Mary's churches in Barnsley. His youngest sister was left a widow when her husband died in service in 1916. The Absent Voters' List gives Lionel's rank as Major in the Army Service Corps in the war - medal roll records also suggest he was a Captain in the York and Lancaster Regiment, initially arriving in France in April 1915. Gladys' brother Reginald served in the war as a Private in the Liverpool Regiment - he survived. With this great family involvement in the war and no children to keep her at home it is not surprising that Gladys felt the need to 'do her bit' and volunteer. Later Gladys and Lionel move to Surrey where she dies in 1985. I have found their names together on a couple of ships' passenger lists in the 1950s - it looks as if they enjoyed a cruise or holidays in Tenerife! I will keep looking for more information about Gladys in the local newspapers - maybe her service or that of other YMCA volunteers from Barnsley is mentioned at some point.